This is one of the more distinctive merchandising aids used by Burger King to promote their various Star Wars promotions. Although most of the fast food chain's displays centered around their drinking glass premiums, this one advertised their "Super Scene Collection" give-away. That upper Cloud City portion is just great, as is the asteroid artwork used on the lower portion. 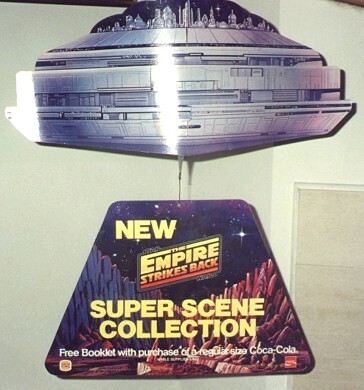 This piece shipped with cardboard TIE Fighters, which were designed to dangle from its base, but they are missing from this example.